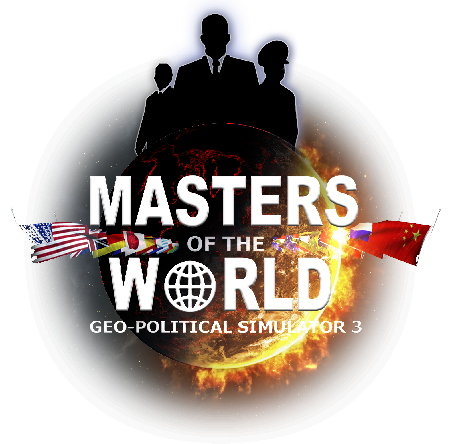 Masters of the World, GPS3, is a geopolitical simulation of our current world. 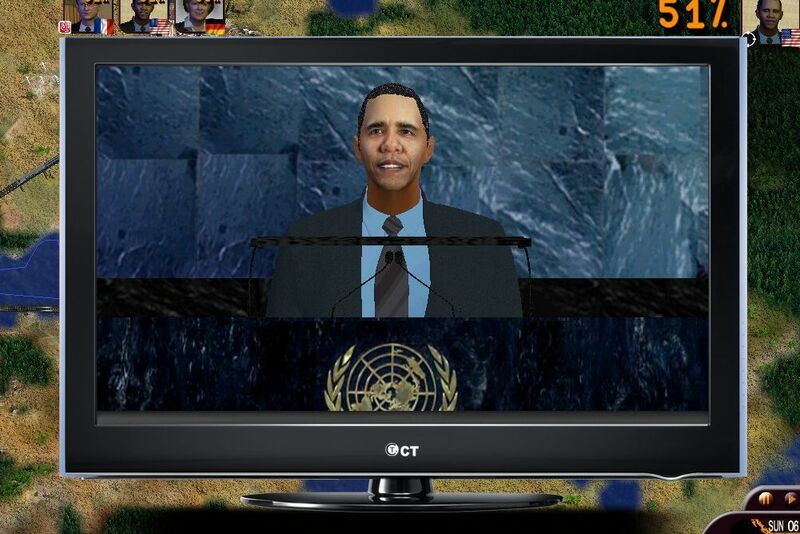 Players can play as heads of state or government (president, king, prime minister, etc.) of a country that they choose when they begin. They can take action in a number of areas: economic, social, military, political (domestic and foreign), environmental, cultural, transportation, etc.All the countries of the world are represented with their own variables and ways of functioning.The game includes phases for economic management, trade, wargame, construction, espionage, simulation, and political manipulation. Masters of the World can be played in single-player mode or in networked multiplayer mode. 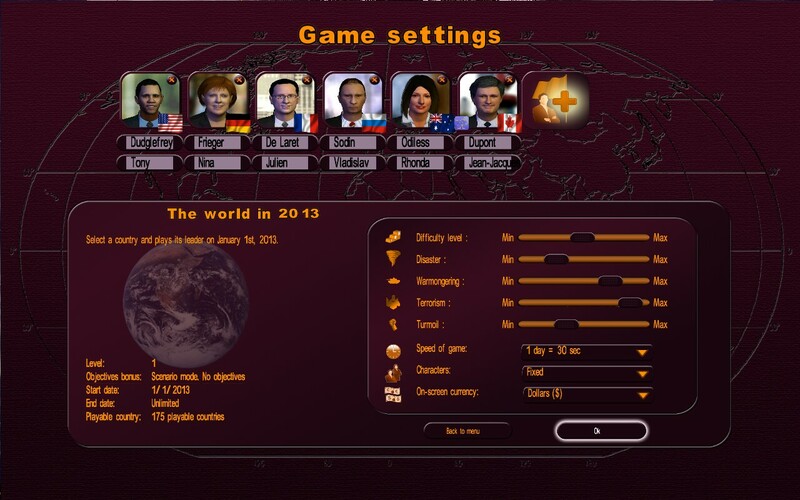 The player can choose to manage a single country or multiple nations at the same time, and develop collaborative strategies to change the fate of the world.Game settings can be adjusted in a number of areas, including terrorist organization activity levels, natural disaster probabilities, reactivity of the people, and war triggering.Twenty or so scenarios in line with current events are included, including “American Fiscal Cliff,” “Israel-Iran Escalation,” “Organization of Rice Exporting Countries,” “European Budgetary Golden Rule,” “Building South American Pipelines,” “African Economic Boom,” “Third World War,” “Triple A,” and “Famine in Southern Sudan.”. Throughout the game, the player/head of state should always keep an eye on his or her popularity level, which is obviously essential during the election period, in order to stay in power as long as possible. Maintaining the state’s accounts and the budget deficit is also an important element for longevity. From the Department management menus, the player can distribute budgets with a high level of detail. Examples of dedicate budgets: services for the elderly, the fight against cancer, integration of persons with disabilities, youth employment aid, computer police, counter-espionage services, student housing, agricultural research, live entertainment, the fight against doping, and recycling. Hundreds of actions and laws are also available in these menus. Some examples: modifying a tax (nearly 30 taxes are available), extending the retirement age, subsidizing an activity sector (over 130 sectors included), limiting the powers of political parties, increasing social welfare benefit minimums, changing the head of state’s term of office, hiring employees for a specific sector (teachers, nurses, police officers...), creating or abolishing military services, regulating marijuana consumption, and alternating traffic in large cities. Each proposed law must be voted on by Parliament - for democratic regimes -, or by the people if the country has a referendum procedure. Whether or not the law passes is determined based on votes from the different political parties represented in Parliament, which are in line with reality. The player can also take direct action, with approval from the legislator, often in emergencies, such as nominating department secretaries, having opponents arrested, banning harmful organizations, or enacting a state of emergency or martial law. To prevent tension, they player can set up a meeting with any figure and try to flatter them, negotiate (examples: an agreement with a union, an economic contract or alliance with a head of state, an interest rate with an international lender), corrupt them, or blackmail them. All of these figures are represented with 3D faces and express themselves orally. The resulting scenarios, interventions, and dialogs add up to over 13,000 texts and 8 hours of recorded dialog. The intelligence services play a major role in the game. They have an entire arsenal of espionage and “special” ops tools that they player can use, but at his or her own risk; if they are discovered, it could lead to a scandal. The player can, for example, investigate an opposing political party, dismantle terrorist networks, sabotage a foreign infrastructure, have an opponent assassinated, etc. International organizations (over 50 organizations included) are also represented and interact with heads of state. For example, in the European Union, the G8, or OPEC, policy votes are held at regular summits; in the UN, players can denounce a nation in order to obtain the Security Council’s authorization for a military intervention. Players can also create their own organizations and define their types (free trade zone, monetary union, politico-military organization, exporting countries), budget, geographical area, bylaws (voting system, meetings with heads of state, common political ideology...). The animated world map is shown in 3D with relief and vegetation, national and regional boundaries, cities, the main transportation methods and lines, and the planet’s major locations. The map can be displayed flat or as a globe, in full screen, and can be zoomed in to a very high level of detail. On his or her territory, the player can place various construction sites, including nucelar plans, wind farms, military bases, pipelines, offshore drilling stations, high-speed train lines, airports, port centers, etc. At the military level, the game includes an extremely realistic and detailed wargame with options for different types of units for different countries and precise locations of their military bases. The player, as the commander in chief, can lead each unit independently, give global orders, or plan a series of orders. Using the mini-map, the player can get an overview of his or her different fronts. Players can also relegate the leadership of their military operations to the head of the military, managed by artificial intelligence. In addition to reports from department secretaries, the player has several sources of information: a daily newspaper that relates the planet’s major events, a discovery tree that shows technological advances and opportunities for research sectors, an evaluation of signed contracts, polls that the player can request from his or her national statistical agency, and different thematic maps, including maps showing economic and strategic alignment with all the other countries in the world.Lastly, a professor of geopolitics can provide ongoing assistance to the player throughout the game. He can explain the game’s major functional principles for politics, economy, strategy, and espionage, alert the player to problems that need to be solved in his or her country and the actions that can be taken, and provide the player with some political tips and tricks. 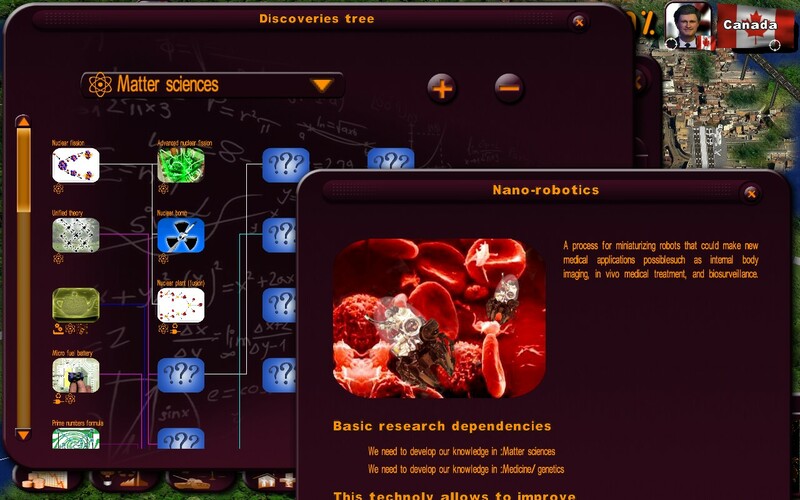 In addition, the game includes a Quiz to test the player’s knowledge with over 3000 questions. In development since 2004, Geopolitical Simulator, a.k.a. G.P.S., strives to be ambitious and one of a kind, constantly evolving, with a team of dedicated specialists and developers. Its objective is to offer a simulation of today's world whose comprehensiveness is constantly being improved—notably with data that is regularly updated—and to develop new scenarios that reflect world events and geopolitical upheavals. G.P.S. is a software from the French company Eversim, a company specialized in the development of network simulation games in a persistent world. This company was founded in February 2004 by the former heads of the video game editor Silmarils, which launched 30-odd products between 1987 and 2003. The tools developed by Eversim are used as serious gaming by several organizations (NATO for example) as a training and teaching tool for politics and diplomacy, as well as for simulating crisis situations. Below is a video that shows a special version of GPS being used by NATO for training future diplomats, within a simulation session of a geopolitical crisis.